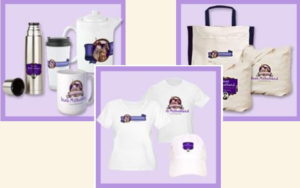 News Stories – Wild West Women, Inc.
A small town creates a big event for a great woman. In so doing, the townsfolk and neighboring denizens discover for themselves, not only their history but, more importantly, find pride and inspiration in their hero. 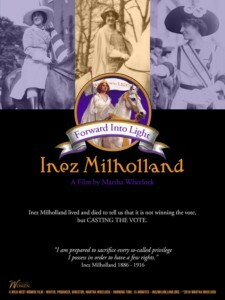 I was invited to Lewis, New York for a celebration of Inez Milholland’s 130th Birthday where I would present my new film, Inez Milholland ~ Forward into Light with a Q & A afterwards. Before the film a local historian would be revealing her research on the history of the Milholland Family in Lewis. History talks can often turn to recitation of dates, primogeniture and be-gots but this local, curious, authentic researcher of Lewis and Milholland history shared everything she found about the Milhollands, with humor, enthusiasm and rich resources. My understanding of Inez’s background was filled out with real flesh! 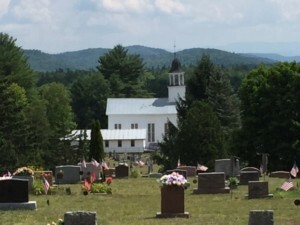 Instead of a few scattered souls at the Lewis Congregational Church for this event, the church, albeit, small, was filled with an attentive audience. They loved and cheered the Inez film, and asked good questions. They told me how someone over the past weeks had been coming up to the cemetery where the Milhollands were buried. They had been setting the markers a-straight, weeding and clearing grass from all the stones, and cleaning the gravestones. It must be angels, I remarked seriously! When I announced that copies of the Inez Film on DVD’s were for FREE, they held their breath: is that really so? Can I really have one to show my grandchildren who grew up here? 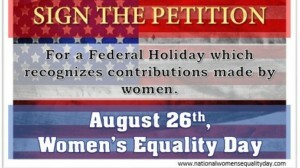 I want to take one to the 6th grade teacher whose great-grandmother knew Inez’s Mother. What a joy to give out those films! 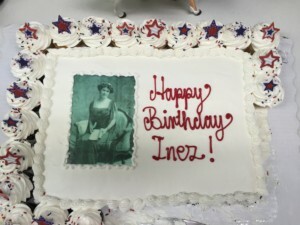 Then we all, yes all the congregation, adjourned to the big cozy kitchen for Inez’s birthday cake, complete with her portrait, and adorned with a “statuette of a woman on a white horse, with a sash vote for women, which one of the church ladies had made. 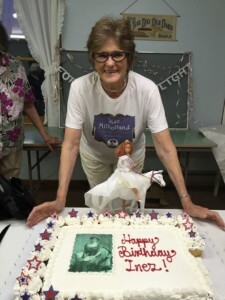 It was a glorious cake to honor Inez. Another church lady had made 30 cupcakes, with stars on them, to surround the cake. It was a very touching moment and everyone who would admit this, felt the energy of the evening. The next day, Inez’s actual birthday, August 6, my sister and I first visited Meadowmount, the very large 34 room home that John E. Milholland, Inez’s father, built at the height of his wealth – ostensible to give poor children from the inner cities , a summer place to retreat among animals and healthful country living. John ‘s intentions were not realized actually, as he lost his wealth carelessly, and the family then lived both in London and New York much more modestly, within John’s newspaper salary. Today the buildings are the MEADOWMOUNT SCHOOL OF MUSIC, one of the finest and intense practicum for strings and piano. 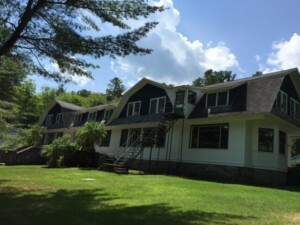 There studied and taught such teachers as Jascha Heifetz, Joshua Bell, Yo-Yo Ma, Itzhak Perlman, Pinchas Zukerman, Paul Zukofsky and hundred others. It is still such an esteemed school. There I met Mary Macgowan, a director and another fine local historian who shared more Milholland history with me. A wider and deeper picture of what forces helped to form Inez’s ethics and energy emerged more than any biography I had read. The most moving visit during that trip was to meditate and absorb Inez at her actual grave. 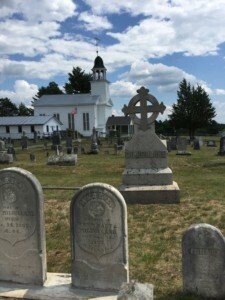 The cemetery plot, which previously had been mysteriously cleaned and cleared, had indeed been manicured, but by arrangements from John A Milholland, Inez great nephew, whose father was descendent of John A, Inez’s brother, the only child to produce progeny. 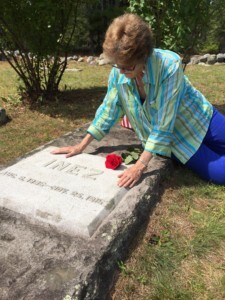 The red rose I placed on Inez’s grave was in keeping with the how she was viewed as a great American Beauty. When her coffin arrived from Los Angeles, into the town of Lewis for burial, her father had adorned it with 2 dozen red roses. 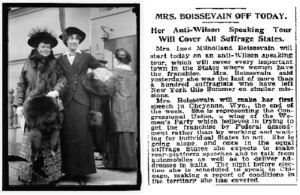 Inez had a younger sister (also buried there), Vida, who traveled with Inez and carried on Suffrage work after Inez’s death. 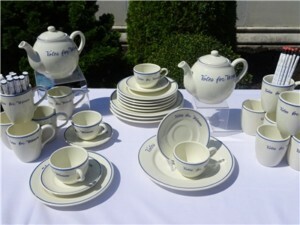 In fact Vida was arrested and went on a hunger strike in 1917, following in her sister’s spirit. 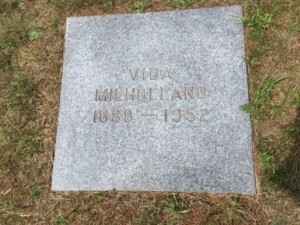 Vida never married but lived the last 30 years of her life with a woman companion, caring for her mother in one of their residence They were always plagued with financial worries and she committed suicide in 1952. The whole family was rested on the top of the hill, looking out over the meadows toward the great Green Mountains of Vermont, across Lake Champlain. What a beautiful spot. The Friday event extended beyond the folks of Lewis. As we covered three counties, giving away the DVD to libraries, historical museums, even hotels and civic centers in Essex and Clinton Counties, Plattsburgh and Elizabethtown, great appreciation was express by those who received this FREE DVD. The recipients felt honored as all we met knew Inez’s name and were familiar with her short life’s story. They treasured the fact that she was a local girl, who did more than just ride a white horse and die at age 30 from working too hard on the campaign for Women’s Suffrage. She was their Hero. Official Film Poster on Sale Today! The official movie poster is here. Perfect for your office and classroom.